How to build your own awesome shed! 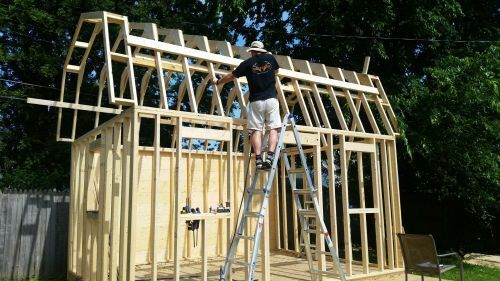 You can easily learn how to build a shed whether it be saltbox, barn, lean-to or a gable style shed. All you need to build your new shed are the guides I have included below, along with some basic building skills and a few tools. And I might add the best way to build your shed is to get your family involved and you will all have some fun! 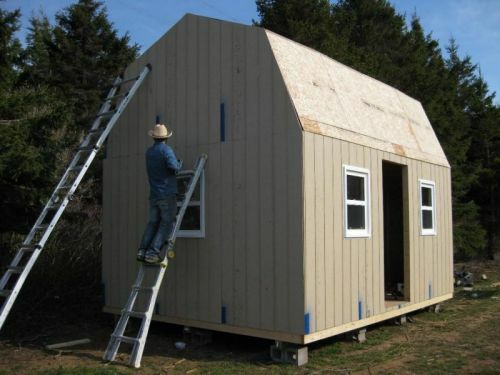 These guides apply to building sheds for many purposes whether you need one for storage, a garden shed, tool shed, home office, studio, arts and crafts shed, she shed, man cave, back yard bar, or just a quiet place to hang out and get away from it all. The following links will guide you through what I feel is the best and easiest way to get that new backyard shed you want to build. All the information you need is right here, online, and available for you to read now. No manuals to download. Just click below, read, and get your shed construction going. Please keep one thing in mind with your shed building project - Always have fun, and please be careful! Important planning guidelines for you to consider for learning how to build a shed. When you're learning how to build a shed, there are some considerations to check into. One of the most important is finding out your localities building codes. Other factors include weather conditions, deed restrictions, and your budget to name a few. Learn more about the planning stages for your shed building project. How to build shed floors. Check your local building codes if you haven't already to determine what type of anchoring you need to do for your shed. Chances are if you have applied for a permit you'll know the answer to this question already. Usually, there are two types of anchoring if you are not building on top of a concrete slab. You can anchor your floor by attaching it to posts which are anchored in cement usually down below the frost line, or you can use cable tie downs. Using the post anchoring method you will typically have anywhere from two to four anchors located in the corners of the floor, with support blocking spaced evenly along the way in between the anchors. Cable tie down method of anchoring is not as effective, but is required in some counties across the country. Its a good idea to check your county guidelines on the best method for anchoring your shed floor. Complete guide on shed floors. 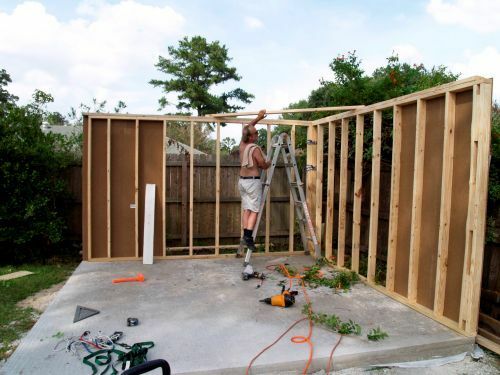 How to build shed walls. 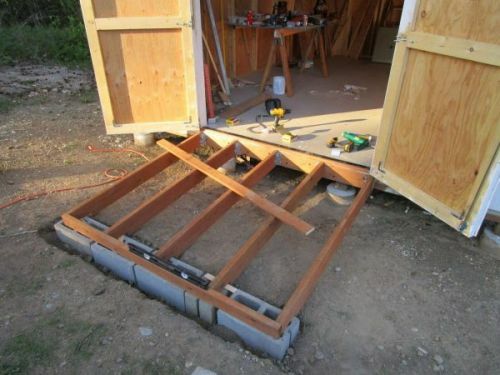 You can use the surface of your shed floor to build either wall first. First, measure and cut your top and bottom plates. Now place them together and mark off locations for your wall studs and door stud location. 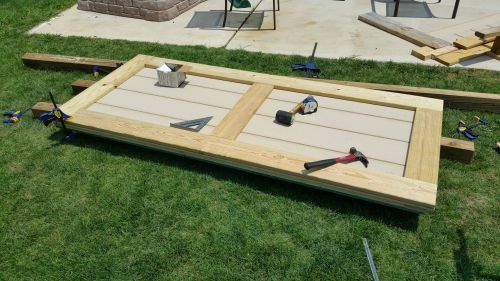 Cut your wall studs and door studs (door studs if you are building a saltbox shed) and lay them in between your top and bottom plates and nail into place. Complete guide on shed walls. How to add siding to your shed. What kind of siding should you use? You will need to decide this before planning and building your shed. From Smartside siding panels to lap siding, its all explained for you. Learn more about siding your shed. How to build shed doors. Perhaps the most difficult task to build a shed is the construction of your doors. Here is a method I used all the time when I built sheds professionally. Shown is building double shed doors, but you can use it for single shed doors also. Complete guide on how to build shed doors. Pictures, diagrams and more. How to build your shed roof. 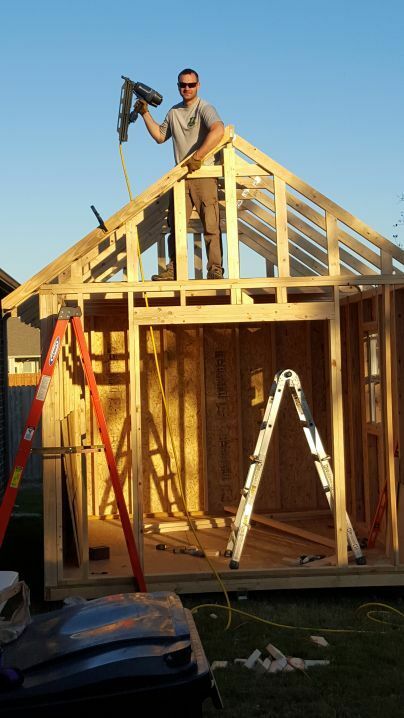 Your shed roof can be built by either making trusses or framing with a ridge board and rafters. Barn sheds usually are built with trusses. Gable roofs could be one or the other. Saltbox style roofs can be either or. 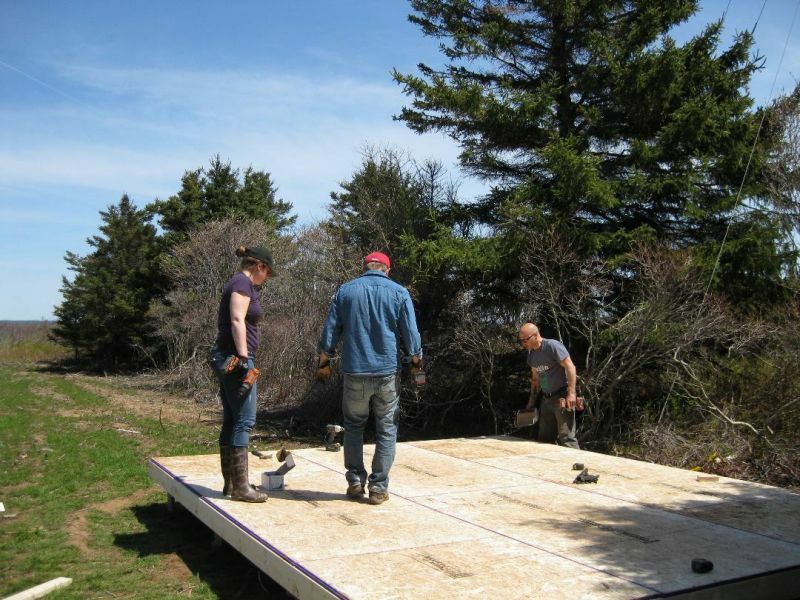 Learn more about how to build a shed roof. Adding a loft to your shed. One of the best features of your shed will be the loft. The best style shed for a loft is the barn style shed because of the gambrel style roof. Lofts can be used for storage, and if you are building a shed home, tiny house, or small cabin, the loft can be used for sleeping. 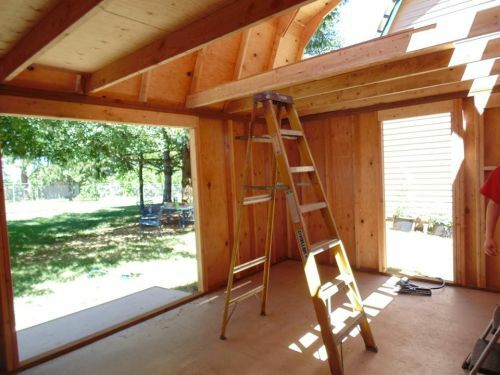 Here's more information on how to build a loft for your shed. 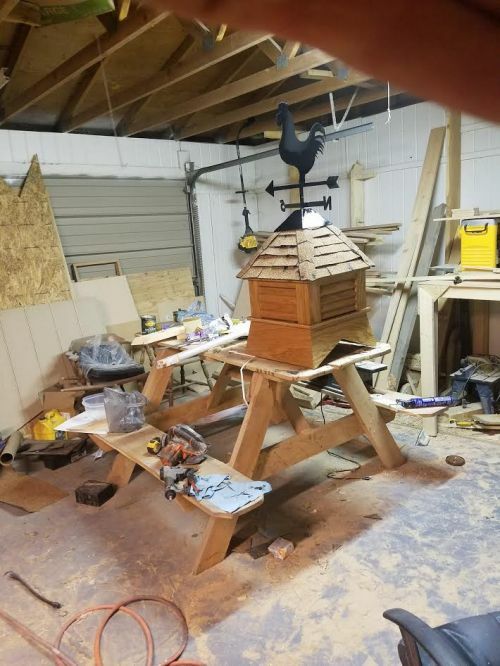 How to build a cupola for your shed. Cupolas originally served the purpose of ventilation of a roof space. However, you'll find that adding a cupola to your neat shed will further enhance the charming appeal of your already awesome shed! I have some neat plans for adding a cupola to your shed. How to build a shed ramp. A sturdy and well built ramp is essential if you plan on moving riding mowers and other heavy equipment in and out of your shed. The following is one if the best and easiest ways to build your shed ramp. 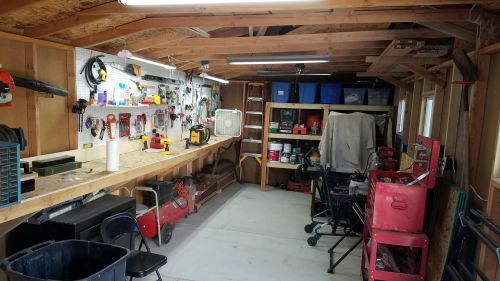 An easy way to add shelves and benches to your shed. Adding shelves to your shed will just increase the efficiency and use of your shed. Often you will have left over materials such as pieces of 2x4's, siding, and plywood. You can easily use these to build shelves and benches for your shed. Here's a neat way to add shelves and benches to your shed. Putting the finishing touches to your shed. Finishing your shed with paint and caulk is important if you want your shed to last longer than normal. Before painting your shed, I recommend that you caulk with a paintable siliconized latex caulk. Caulk along all exposed horizontal joints where water can get in, and also caulk along vertical joints where water can work its way in. 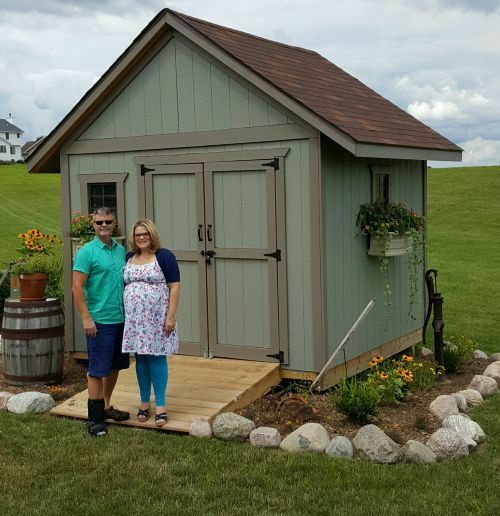 Learn more about how to finish your storage shed to make it last a long time. Mentioned earlier above for checking building codes, here is a link for the building codes put out by FEMA. Do not purchase materials or attempt to build this shed project unless you have studied the information provided thoroughly, and have verified all dimensions and material requirements for yourself. Also verify that the plans conform to local building codes and practices. Although every effort has been made to ensure the accuracy of the information and design, the user is ultimately responsible for the use of this information. All information provided is copyrighted and cannot be duplicated without the permission of Shedking.